LoveLove Films are delighted to announce that the British Council have reached out to us to include Chin Up in the British directory. Each year, the British Council choose a selection of films from the UK to add to the British Council Films Directory. Chin Up can be seen here. The UK Films Directory is an extensive searchable database of new British films, containing a continuously expanding record of the best UK features, shorts, documentaries, and animations. It’s archive of British films extends back to 1998. LoveLove Films won MOFILM’s global competition, Many Voices ‘ Year of the woman’ with Chin Up. Chin Up is about one of our animators, JoAnne Salmon, who tells her story of being born with Treacher Collins Syndrome, a rare genetic condition characterised by deformities of the ears, eyes, cheekbones and chin, which causes breathing problems and hearing difficulties. She explains the challenges she has faced throughout her life, and how she has not let them stop her following her dream of becoming an animator. Throughout her childhood, JoAnne loved to draw herself as heroic characters to escape the insecurity and feeling of being different that came with her condition. However, JoAnne never drew her facial features any differently to fit the scene of a heroic warrior or mystical mermaid, she always stayed true to her appearance in her drawings. The documentary touches on poignant milestones that have impacted JoAnne and made her the strong and inspirational woman that she is today. Chin Up highlights on the female empowerment that is giving 2018 the great ‘Year of Woman’ status. 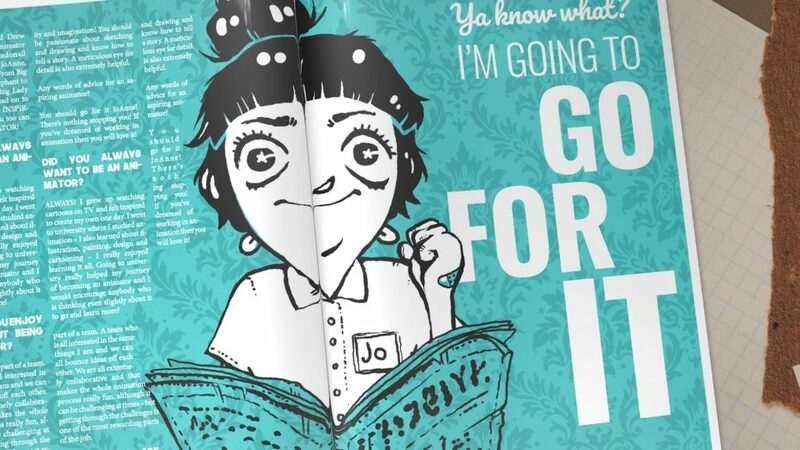 JoAnne’s story also fits into the much larger narrative of how attitudes towards women are changing in todays society. Chin Up was narrated, illustrated and animated by JoAnne, giving a true insight into growing up with a visible disability. JoAnne and the LoveLove Films animation team created the documentary with intricate 2D mixed media using childhood photos mixed in with beautiful and colourful illustrations and animation. Chin Up is about to start it’s festival run in 2019 and we are very excited about sharing this film with a global audience. We hope that this short documentary will touch the hearts of many.